For a long time, dentures were the only sensible way to restore a set of missing teeth. Dentures always have had a litany of flaws, but there really wasn’t a better alternative. If you wanted to have a full smile after losing a lot of teeth, you had to live with loose-fitting, uncomfortable and inconvenient dentures. As time has passed and dental technology has moved forward, a better solution has arrived. Implant supported dentures, also known as overdentures, is a more effective and efficient way to get a mouth full of teeth back. University Dental in San Diego specializes in overdentures, offering premium service at an affordable price. (per jaw) including 3 implants, precision attachments and denture. Implant supported denture is a form of removable denture that can replace teeth for someone who is missing all or many of their teeth. The procedure involves inserting titanium anchors into the jawbone as a base and then securing the dentures to the anchors for better retention. 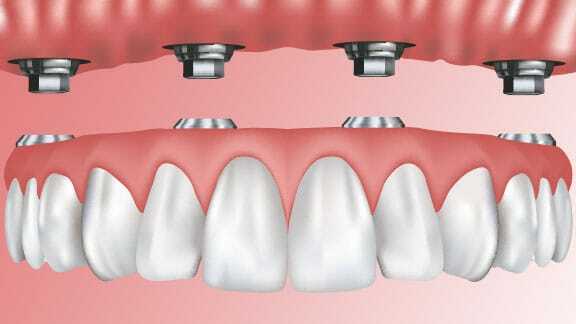 By securing the dentures to a dental implant, the dentures are more secure and offer better functionality. One of the biggest issues with standard dentures is they do not stay in place. They slip and slide in place, sometimes even falling out of the mouth in the middle of a conversation! Overdentures are locked into place, and by securing the dentures to a dental implant, there is no chance they will ever fall out of place or slide around. The stability that overdentures provide does more than just prevent social faux pas. The improved stability of implant supported dentures allows you to thoroughly chew food, which helps break down food more efficiently. Overdentures allows you extract all of the nutrients you need from food when you eat, leading to a more healthy and happy you. When teeth are missing from the jaw, the jaw bone over time will shrink and become weaker. By inserting dental implants into the jaw bone, the bone is stimulated whenever you eat or chew. This will slow down the shrinkage of the bone, and in some cases even stop the process entirely. Are you missing teeth and want a better solution than dentures to replace the missing teeth? University Dental in San Diego has the solution. Implant supported overdentures are a safe, efficient and effective way to get a full set of teeth that look, act and chew exactly like real teeth. Ditch the dentures and upgrade to overdentures today. Give us a call at (619) 582-4224 for more information.